the watch towers built by the Forest Department close to the water-holes, is a thrilling experience and one gets the feeling that one is millions of miles away from civilization. 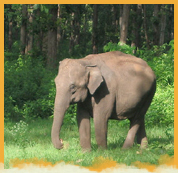 These majestic animals have made the Chandaka Forest their home, and can be seen quite frequently. They are however completely wild, and on occasion become dangerous too. Apart from the fabulous elephants, chital, bear, pea-fowl, sambar and numerous other animals roam about doing their daily business unhampered. The Forest officials have also spotted pugmarks of cheetahs within the forest. At this moment we don't have any specific Tour package for Chandaka Elephant Reserve, but our representative would be happy to assist you if you are planning to visit Chandaka Elephant Reserve you can contact us with your query on the following no / email. As name suggest it a elephant reserve and Elephant is the flagship species of the reserve other important animals that can be spotted there are Leopard,Chital, Common langur, Mouse deer, Barking deer, Rhesus monkey, Indian mongoose, Ruddy mongoose, small Indian civet, Wild pig, Sloth bear¸ Indian wolf, Ratel, Hyena and Pangolin. Birds that can be spotted there at the elephant reserve are Red jungle fowl, Great horned owl, Black headed oriole, Crested serpent eagle, Coucal, Paradise fly catcher, Peafowl and stone curlew. Chandka Elephant reserve is also famous for butterflies, They are most beautiful of all insects and are found there in mind boggling variety. Most of them are abundant during moonson and post moonson months within a height of 3 meters from ground. Look for them in forest openings, road sides, flowers, grasses, edges of water, wet mud, bird and animal droppings or food plants either feeding or basking. Common ones here are common Mormon, blue Mormon, common Emigrant, common Leopard, common Hedge Blue, Indian Crow, double banded Crow, common Sailer, common Bush brown, grey Pansy and peacock Pansy. Area	: 175.79 Sq. Kms. Airport	: Nearrest airport Bhubaneswar (20 km) with air connection to Bangalore, Kolkata, Delhi, Mumbai, Chennai, Vaizag, Hydrabad. Railway Station	: Nearest Railhead is Bhubaneswar on Eastcost Railway station, which has super fast trains connecting all major cities. Road : Chandaka in about 20 km by road from Bhubaneswar, which has good inter-state road linking all major cities in INDIA.